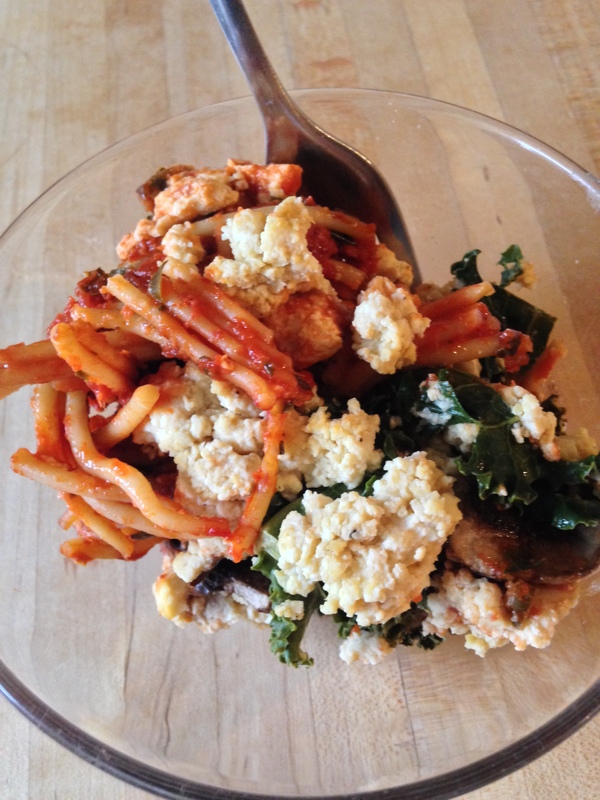 This is a great recipe for vegans, vegetarians or a meatless meal with a salad and beans. This is also good in wraps with sliced tomatoes, pea shoots, shredded carrots, sliced cucumbers and drizzled with olive oil. For me, I think that baked tofu has better flavor than stir fried or deep-fried tofu. I used Non-GMO, organic tofu for this recipe. Enjoy! Drain water from the packaged tofu. Wrap the tofu in paper towels to remove the excess water, put on a bowl, then top with a plate and something heavy to help squeeze out the excess water, for approximately 1 hour. While tofu is being prepped, make the marinade in a bowl. Mix well, and place marinade in a gallon Ziploc bag or a container with a lid. Slice the tofu in even 1” slices and place the tofu in the Ziploc bag or container with a lid, and marinate for 4 hours. Overnight is better, brings out the excellent flavor, when baked. Put tofu on parchment lined cookie tray or Pampered Chef stoneware bar pan. Bake 350 degrees for about an hour till center is springy to touch. Stuffed shells are one of my favorite foods. But, they often tend to be on the unhealthy side with the different cheeses and sometimes meat. 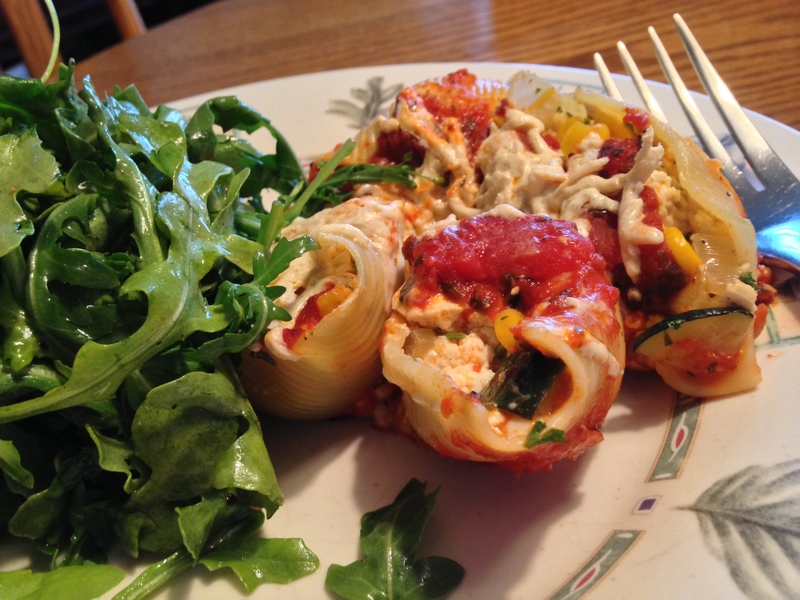 Because I am slowly changing my eating habits, I decided to try and make vegan stuffed shells instead. I have to admit I was a little skeptical. The stuffed shells to my surprise were delicious. I used organic vegetables, non-GMO tofu and whole grain pasta. At first, I thought that maybe the extra-firm tofu was not a good idea, but the tofu worked well in the recipe. Enjoy! Heat the oven to 350 degrees. In a pot of boiling salted water, add the pasta shells and cook for approximately 6 to 8 minutes. The shells need to be firm and not soft as they will continue to cook in the oven. It is important to drain the tofu well. Otherwise the filling will be very watery. I used an upside down colander and put the tofu on top, then a small plate weighed down with a heavy bowl to drain a lot of the liquid out. Drain for approximately 10 minutes. In a large sauté pan, heat up the vegetable stock or olive oil over medium heat and add the onion. Sauté for about 5 minutes, add more stock if needed. Add the corn and cook for another 3 minutes. Then, add the zucchini and cook for about 5 minutes, remove from the heat and add the minced garlic. The heat from the vegetables will cook the garlic. Set aside and cool. In a large bowl, crumble the tofu up with your fingers and add the nutritional yeast. Add ½ of the cheese, sautéed vegetables, zest, lemon juice, and parsley. Mix well. In a 9 x 13 casserole dish, spread 1/2 cup of tomato sauce on the bottom of the dish. Set aside. Stuff the shells with the tofu mixture and lay in the casserole dish. After all the shells are stuffed, cover the top of the shells with the balance of the marinara sauce. Sprinkle the rest of the mozzarella cheese on the shells. Cover with aluminum foil and bake for 35 to 40 minutes or until the sauce is bubbly and the cheese has melted. Remove the foil and turn on the broiler for a few minutes to brown and bubble the cheese. Remove from the heat when done. Serve with a lightly seasoned arugula or green salad.